This novel is a companion to Left Turn At Paradise (Shellwater Key Tales, Book 1), and tells the story of Layla’s long-lost mother, Beth McCarthy. Thirty years ago, desperation drove Elizabeth McCarthy to do the unthinkable when she abandoned her infant daughter to the care of her mother. Now, after years of trying to outrun the memories and the guilt, Beth has come home to Shellwater Key to make amends. She’s survived deadbeat relationships, and a battle with breast cancer, but now Beth faces the most difficult battle of her life…finding a way to connect with the legendary mother she was never able to please…and earning the forgiveness of the daughter who has every reason to hate her. She might even have a chance to find the missing piece of her heart, when Layla’s father arrives in town looking for answers. 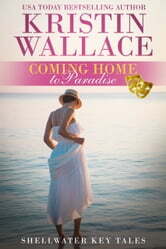 Coming Home To Paradise is a powerful story of a woman who never felt like she was enough. It’s the story of a woman who has been broken by life and who now only wants to make things right. A story about discovering that it’s never too late to find the true love that slipped away.